The President of Ohanaeze Ndigbo, Chief John Nnia Nwodo has reaffirmed the need to restructure the country to make it function more efficiently. He said he has always been an advocate of restructuring because it was the key to opening up the country for development. Nwodo made this known in a convocation lecture delivered at the Federal University, Ndufu -Alike, Ikwo , Ebonyi State on Monday. He further clarified that his disagreement with leader of the Indigenous People of Biafra (IPOB), Nnamdi Kanu was because the Radio Biafra director refused to back the popular call for restructuring of the country. 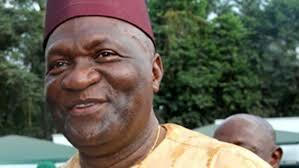 Nwodo noted that he also did not support Kanu’s resort to hate speech and ordering of the boycott of November 18 Anambra elections. Speaking on the need for restructuring of the country, Nwodo said, “I support restructuring, it will afford each region the opportunity to harness their potential, explore their resources, and enhance true federalism.